The character of John Carter has had a colorful history to say the least. The character’s origins were laid with a book by Edgar Rice Burroughs called “The Princess of Mars,” and ten subsequent novels, various comic-books and now a feature-length film have come to bring that character to life. 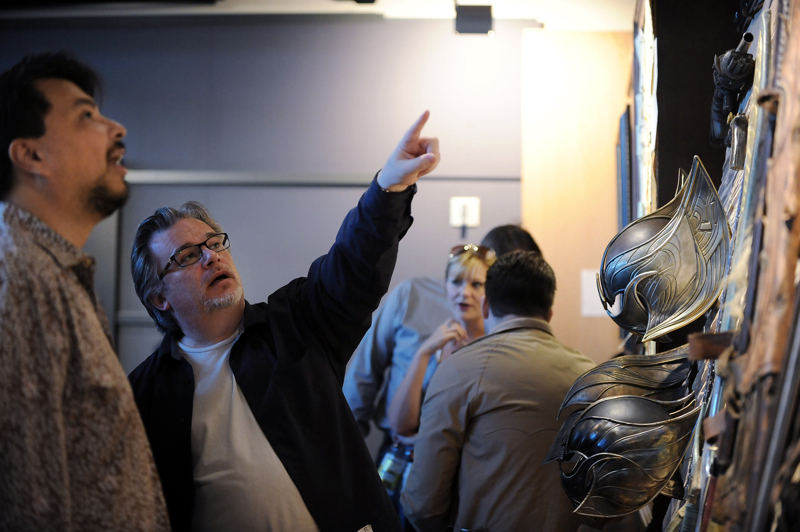 With the film, from Academy Award-winning filmmaker Andrew Stanton, the character of John Carter is about to hit the mainstream with a vengeance, and I was lucky enough to get a sneak peek at what you can expect in the Spring of 2012. We arrived at Barsoom Studios, located in Berkley, CA to get an introduction into the world of John Carter from the man himself, Andrew Stanton, and screen some early footage from the film. We sat in a big screening room and finally the man of the hour appeared. He got right into his presentation and gave us a very detailed look into the world of John Carter. “This is a world that has influenced many of the biggest science-fiction films of the last 40 years,” Stanton replied. “Everything from Star Wars through to Avatar, John Carter is the blueprint for so many great sci-fi films.” The passion for the project was in Stanton’s eyes from the minute he started talking about what he calls his favorite science-fiction novel. After seeing all of the media that John Carter has been a part of, it was odd that John Carter had never made the jump to the silver screen. But a look into the history of trying to bring John Carter to the big screen made it abundantly clear that this has been a film in the making for several decades. Starting in the 1980s with Disney the project went through many movie production houses only to end up back at Disney giving Stanton the opportunity to make the movie he always dreamed of seeing. “I just wanted to see the film be made by anyone, I just wanted to see it,” Stanton said, and seeing the project at Disney gave him the opportunity to bring the novel to life in the form of motion pictures. One thing is certain for the film adaptation of the John Carter character, it could not be in better hands. 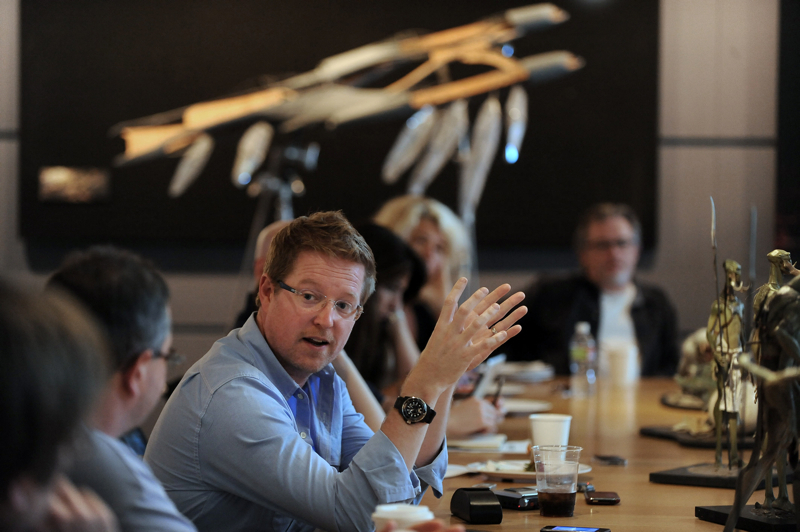 For those who might have reservations about Stanton’s leap from animation to live-action, simply put them to rest, as first and foremost, Andrew Stanton is a filmmaker. At this point in the presentation, we were finally given a look into what the world of John Carter looks like or at the very least, a glimpse at what we can expect the feel of the film to ultimately be. The footage was composed of three clips and a teaser trailer. The first clip sees our titular hero lying on his back in the Arizona desert, or so he thinks. In actuality, John Carter has just been transported to Barsoom (Mars) and the clip plays out with John Carter learning to walk in the lower-gravity atmosphere of Barsoom. 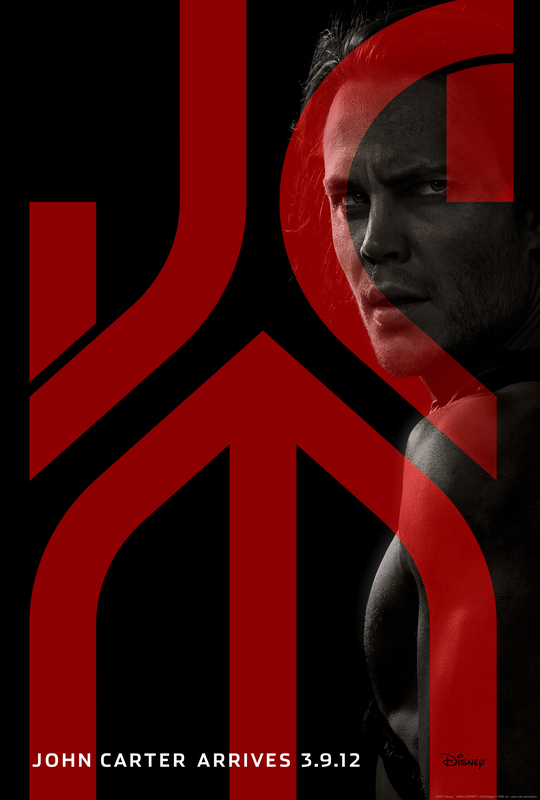 John Carter is played by Taylor Kitsch, who looks very good in the role of John Carter. Stanton talked about the process of casting John Carter, and went with Kitsch much for his physical nature but more for the fact that this is the guy that could potentially play this character for years to come, as Stanton wants to see this turn into a movie trilogy. The desert landscape that was on the screen was visually striking and realistic in nature, and the environment looked like what the real Arizona desert looks like here in the real world. The low-gravity sequence played out with John Carter jumping through the desert and finally landing on a hill in the desert. It is here where we get our first look at the indigenous lifeforms known as the “Tharks.” In the novel, the Tharks are 12 foot green aliens with four arms, and the finished product on the screen definitely fits the description very well. “We wanted them to look like they evolved that way through their own process and history,” Stanton said. The head of the Tharks is Tars Tarkas, played by Willem Defoe. Defoe had to play the role in a motion-capture suite with two cameras mounted on his face to capture his performance, all while on stilts. The performance of Tars comes through with Defoe behind the acting of the character and the scene ends with John Carter coming face to face with Tars and then John Carter jumping through the air. The next clip sees our heroine Dejah Thoris, played by Lynn Collins come in contact with a Thark, Sola, played by Samantha Morton. Collins looks stunning in the role, and with this clip, along with another clip where she plays opposite Kitsch, she is very good in the role. Although all of the footage shown was still going through the polish of pre-production, it all had a style and a shine that looked like something that was unique in the genre of sci-fi. When all of the footage was done and a teaser trailer capped off our time at Barsoom Studios, we were then driven to Pixar Animation Studios in Emeryville, CA. The facilities there were wonderful, and you got a sense of the atmosphere that has produced some of the greatest animated films of the last two decades. After some poking around in the Pixar shop and some browsing of all the various statues of famous Pixar characters, we were taken to a room where no photography was allowed, but many mental photos were taken. This was because many concept art and props from the film were on full display for us and it was spectacular viewings to say the least. All of the creatures that make up the world of John Carter were put out for us to see, including a life-size Thark that would make any game-room in the world the best just for having one of these things in it. Keeping everything very casual, Stanton along with all of us, sat down and talked about the film. Stanton came across to me as a true cinephile, noting Lawrence of Arabia as an influence on the film as it is his favorite film. After all, this is the man that gave us WALL-E, and has been a staple of Pixar’s success since the first feature-length film in Toy Story was released back in 1995. Stanton talked a little more about the obstacles that stand in the way of John Carter, as so many films have borrowed from the novels over the years. 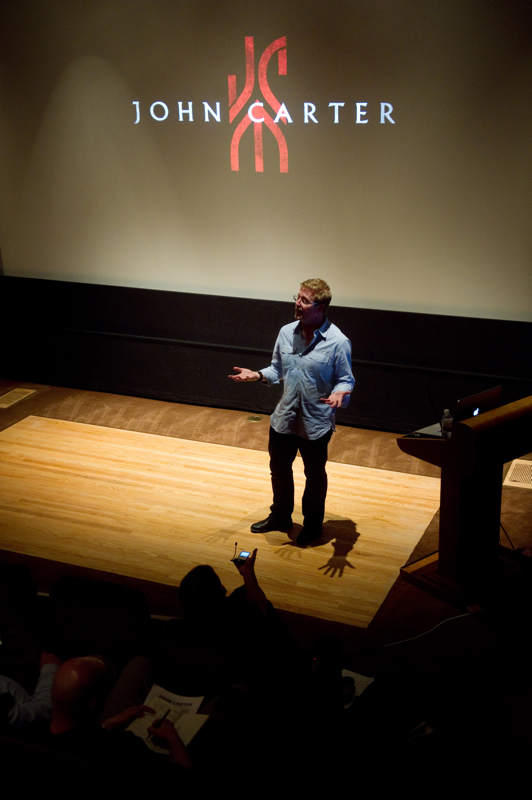 When asked about it’s inevitable comparisons to films like Avatar, Stanton replied “Of course its going to be compared, and how could it not be, but that really doesn’t matter because those types of comparisons are going to be there whether we like it or not.” After much more discussion, we ended our time at Pixar. The evening ended with a dinner at a restaurant in Oakland, CA hosted by Stanton and Disney and was a great capper to an incredible day. All in all, John Carter is shaping up to be a rather unique film experience and another great film from Disney. Look for it in theaters in Spring, 2012.